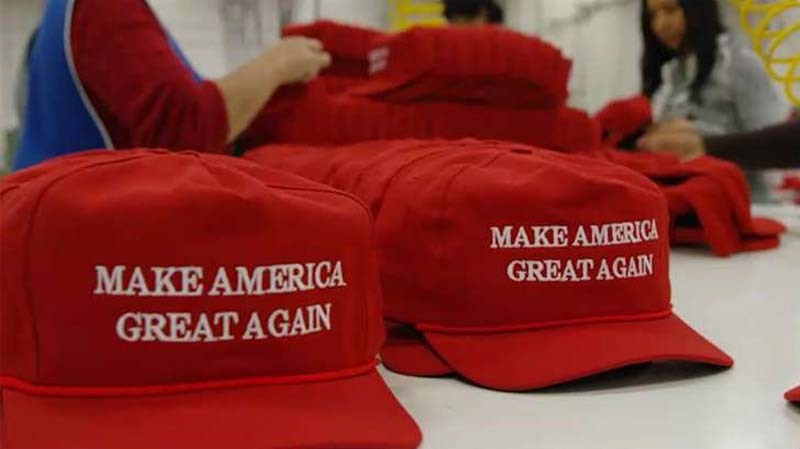 A Danish tourist traveling in New York City says he was mugged at knifepoint by two men angered by a "Make America Great Again" hat he had purchased. The New York Post reports that 18-year-old Jannich Andersen was ambushed in a subway station in Manhattan by two men, one of whom had a knife, who stole the red "Make America Great Again" hat that he bought as a joke gift for his father. Andersen said he struggled over the hat with one of the robbers before the other brandished the knife. "He asked if I knew what it symbolized, and said I couldn't leave with the hat," Andersen told the Post. "He was clearly offended." "I tried to walk away, and then he followed me and grabbed it again, and we just [stood] there both holding the hat," he added. "Then one of my friends told me one of the [robber's] friends had a knife." "I began to shake, and as I heard the word 'knife' I let the hat go," he said. New York police released a sketch of one of the subjects, described as a white male in his 20s or 30s. Andersen added to the Post that he doesn't understand why people would react violently to seeing the hat. "I bought it for my dad as a joke," he said. "I don't know why I decided to wear it. I didn't think some people would take it so far to [try to] stab a tourist over a hat." He adds that he plans to return to New York City in the future, "but not with that kind of headwear ever again."